Pictured from left to right are the students who recorded a video on school violence that won first place at the International Student Television Network Conference in late March in Nashville, Tenn. From left to right, they are May Ramirez (McAllen High), Karla Vargas (McAllen High), Kevin Cavazos (McAllen High) and John Rodriguez (McAllen Memorial High). Overall, McAllen ISD students won four national awards. 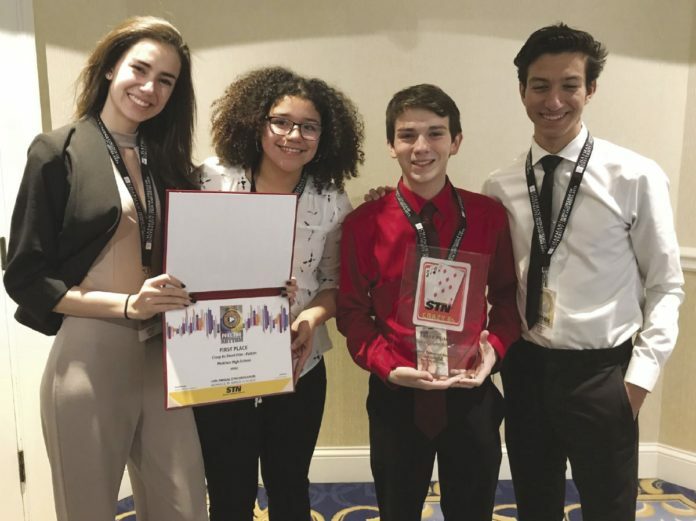 McAllen ISD students in the audio-visual program (known by the call letters KMAC) won multiple awards at the International Student Television Network Conference in late March in Nashville, Tenn. More than 3,500 students competed in more than 30 contests. KMAC students competed in 10 contests and placed in four of them. The group of Kevin Cavazos (McAllen High), May Ramirez (McAllen High), John Rodriguez (McAllen Memorial High) and Karla Vargas (McAllen High) took first place in the Crazy 8’s Short Film Contest. The first place award for Radio Host went to Sebastian Davila (Rowe High) and Selisa Gutierrez (Rowe). KMAC’s Music Video took second place. That team included John Rodriguez (Memorial), Michael Pequeno (Memorial), Kevin Cavazos (McAllen High), Carolina Suarez (McAllen High) and Ezra Landeros (McAllen High). KMAC’s Short Story team took second place. That team included Matt Mandes (Memorial), Acril Acosta (Rowe), Stephanie Rodriguez (Rowe), Sebastian Davila (Rowe) and Nico Hinojosa (McAllen High).